block Saturday, June 14, 2014, the day before Father’s Day! The vases are to be auctioned by Rago Arts Auction Center in Lambertville, NJ. Click on the Early 20th image below to link to this particular auction at Rago Arts Auction Center. The vase images are each linked to their respective page at www.ragoarts.com. The Live Auctioneers graphic that follows each picture is linked to the individual lot’s bidding page at www.liveauctioneers.com. Good luck! 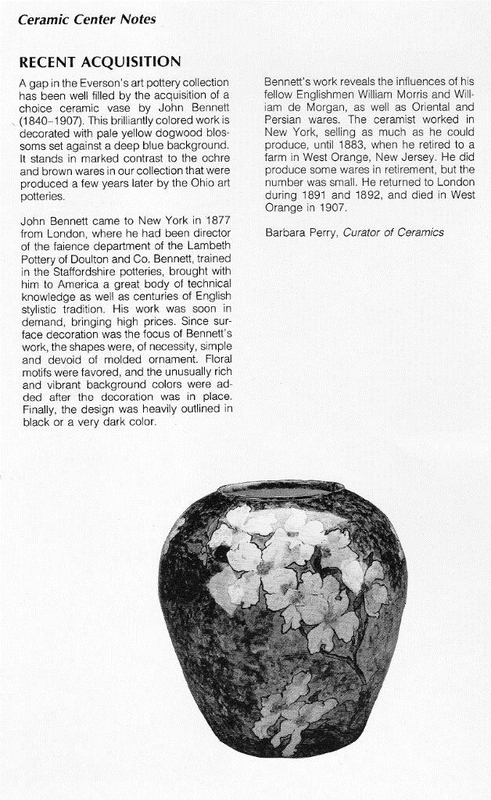 I’m sure someone is going to be happy with their John Bennett vase. Two small chips to rim. The next Lot, 26 is beautiful and I can’t help thinking that it reminds me of a botanical print. 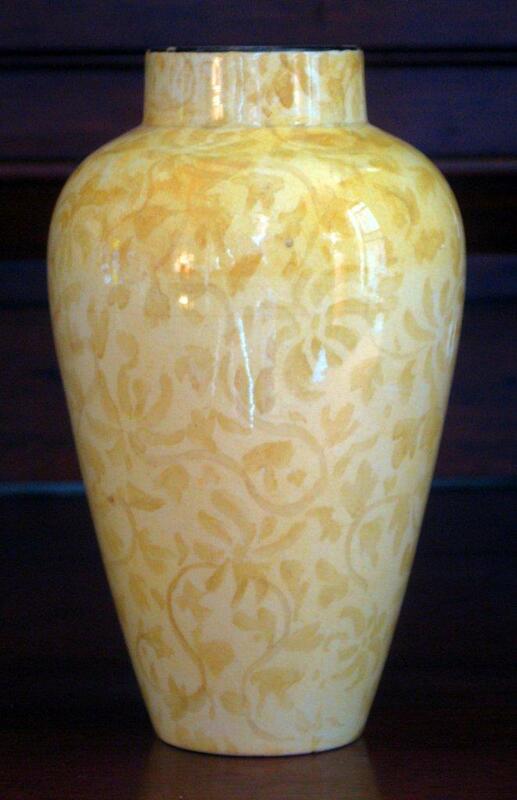 Though I’ve never seen this vase before, I have seen examples of this bulbous body used by John Bennett. 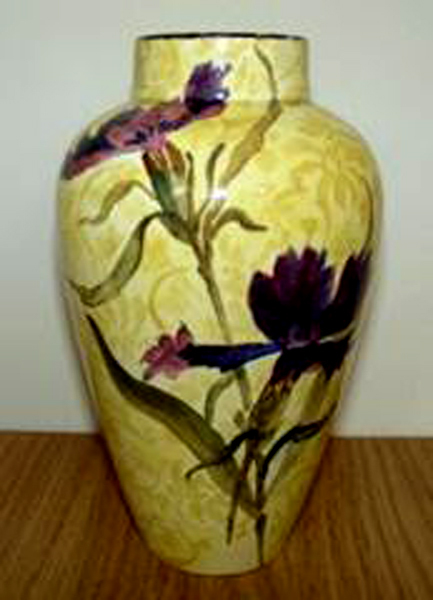 This vase is similar and has the same body as the the one in the collection of the Saint Louis Art Museum. 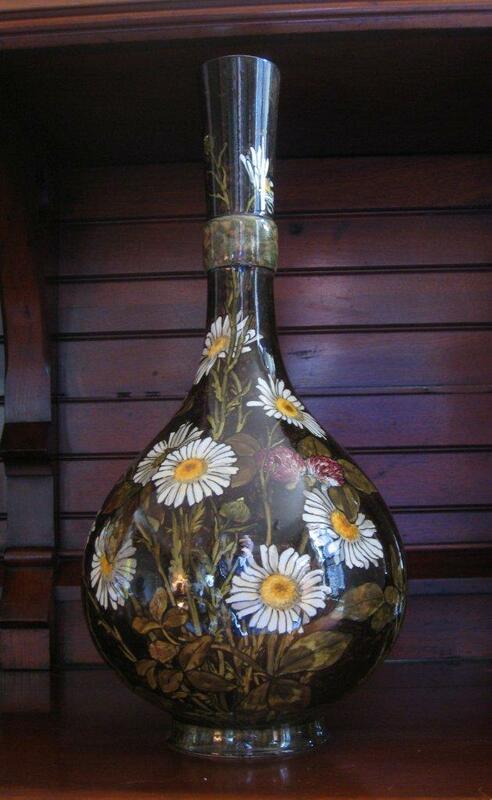 That vase sold in a Rago Arts Auction in October 2010 (Sale Price: $13,420). 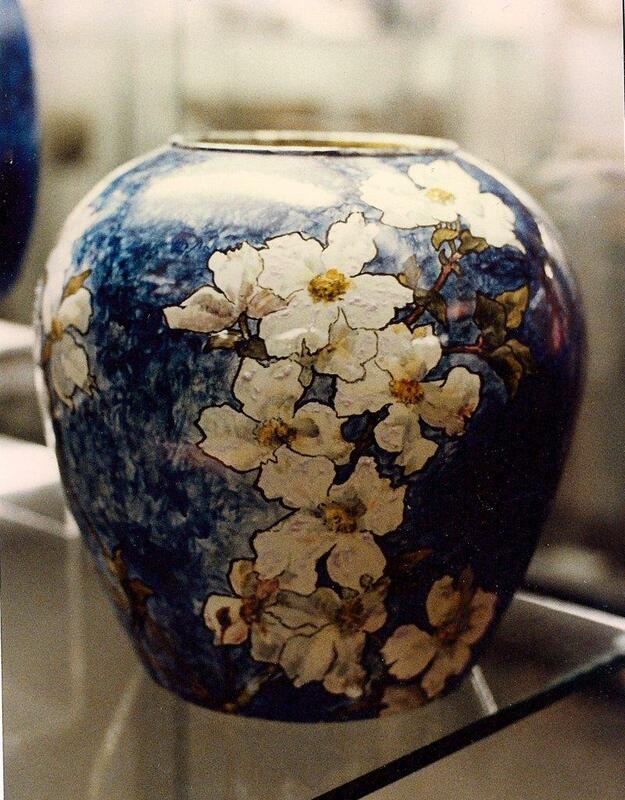 The vase was purchased by the American Decorative Arts 1900 Foundation. ADA1900, focuses on the American Arts & Crafts and Prairie School movements and American art pottery. They acquire museum-quality furniture, lighting, ceramics, metalwork and glass by American makers during the period of 1876-1940, with the goal of placing them within museum collections. 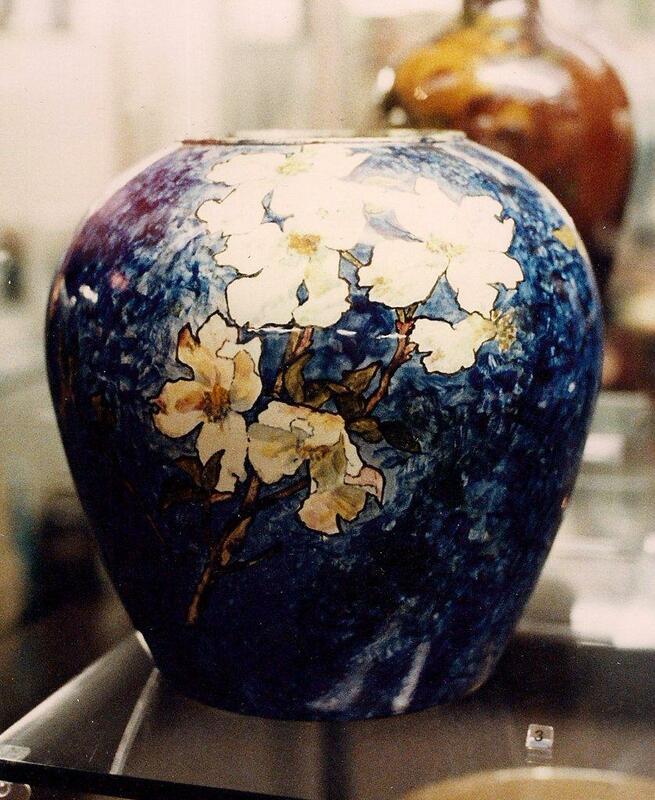 Now this vase can be enjoyed by the public at the Saint Louis Art Museum (SLAM). The Museum is open New Year’s Day and Memorial Day. Robert Tuggle and Paul Jeromack, New York, New York. 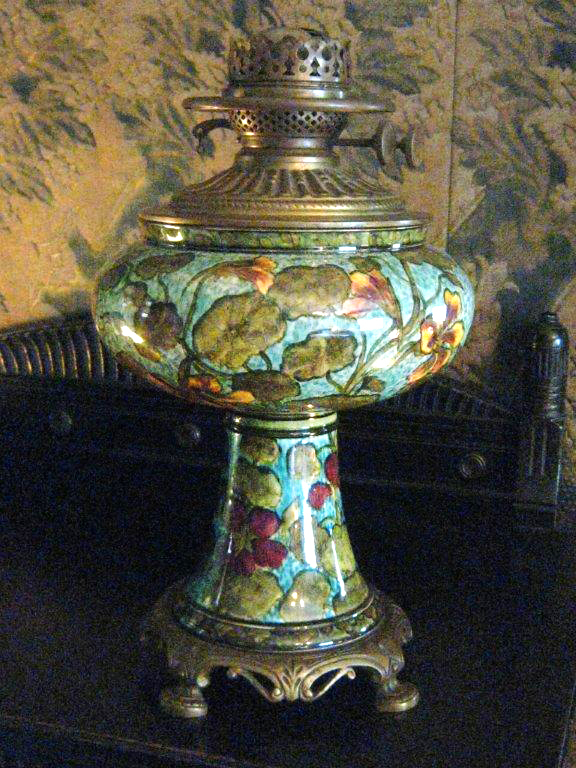 Early 20th century decorative arts and furnishings, featuring work from the Arts and Crafts and Art Nouveau movements. Lighting by Tiffany, Handel, and Pairpoint. Furniture by Gustav Stickley and the Roycrofters. Ceramics by George Ohr, Grueby, Rookwood, Newcomb College, Saturday Evening Girls, Rhead, Zsolnay. Glass from Tiffany, Loetz, Durand, Galle, Steuben, Argy Rousseau, Lalique, wrought metal, woodblock prints, textiles and accessories and more. 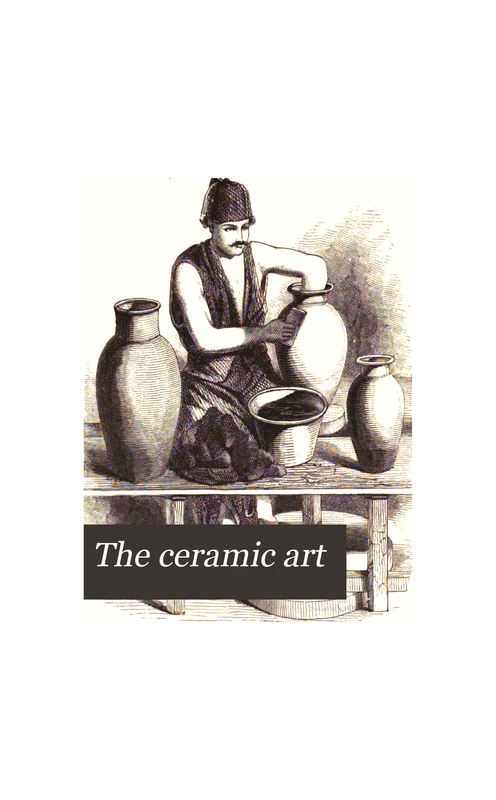 The first specialty at Rago’s and the most successful Arts and Crafts auctions in the field. Printed catalogues are also available for $25 each, please call 866-724-6278. 1. Bidding online – Rago’s partnership with Live Auctioneers (www.LiveAuction.com) allows you to bid online in real time from your computer. 3. Bidding by regular phone – If you want to bid live with them by phone, they can arrange for an agent from their staff to call you. 5. Bidding by left bid – Left bids (also known as absentee bids) give the auctioneer permission to bid for you as if you were in the room, starting on your behalf at the lowest possible selling price and, as long as there is competition, bidding for you – if necessary, up to the maximum amount you have designated. We accept absentee bids by phone or fax. We will even do our best to enter bids during a live auction if the call is received sufficiently in advance and from a registered bidder. That said, absentee bids are time stamped, so the earlier an absentee bid is submitted, the better. The earlier of two identical absentee bids will win the day. Download and Print Rago’s Absentee/Phone Bid form here. For more details on bidding visit here. I do not have rights for any of the images used in this article. Rights to all of the images in this article are linked to their respective owners. Please patronize and support the businesses, organizations and museums mentioned. 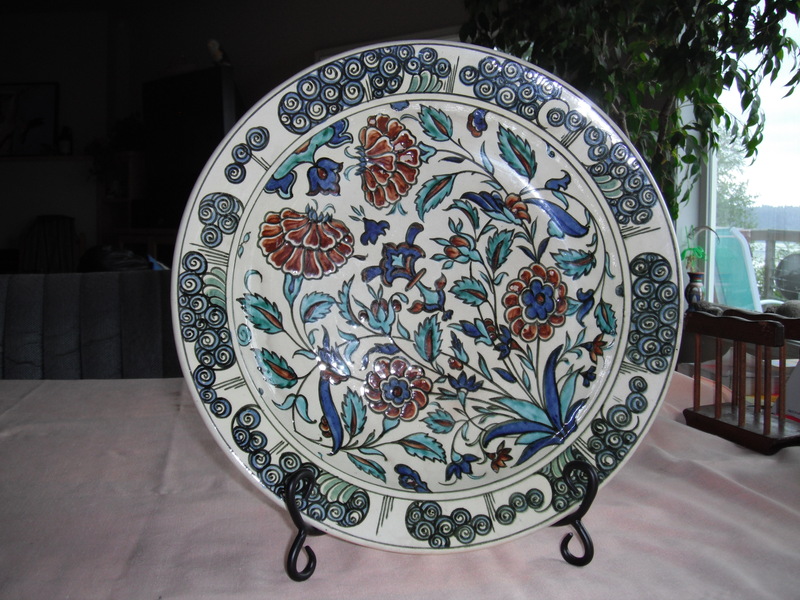 The John Bennett art tile sold in the ebay.com auction on May 29, 2014 after 2 bids for a modest $382.77. I’m sure the buyer was very happy about that! 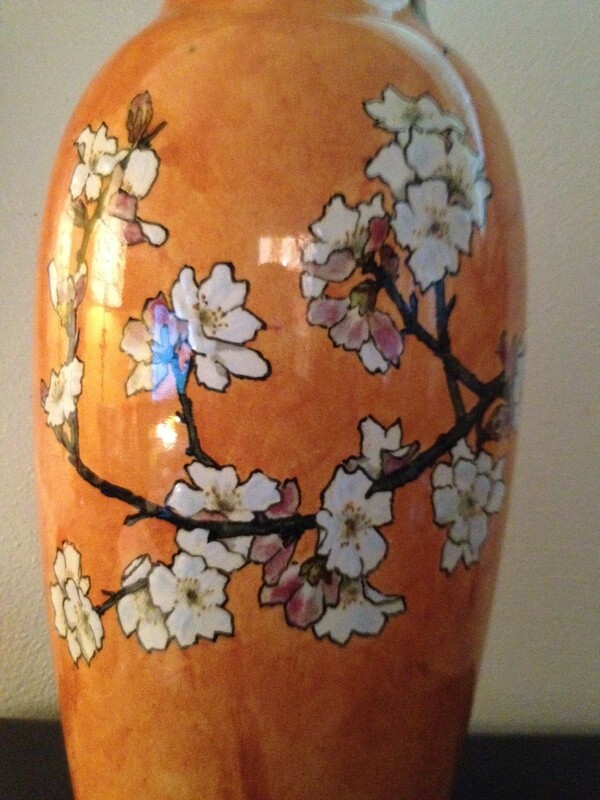 A charming couple was kind enough to send in photos of their John Bennett vase. 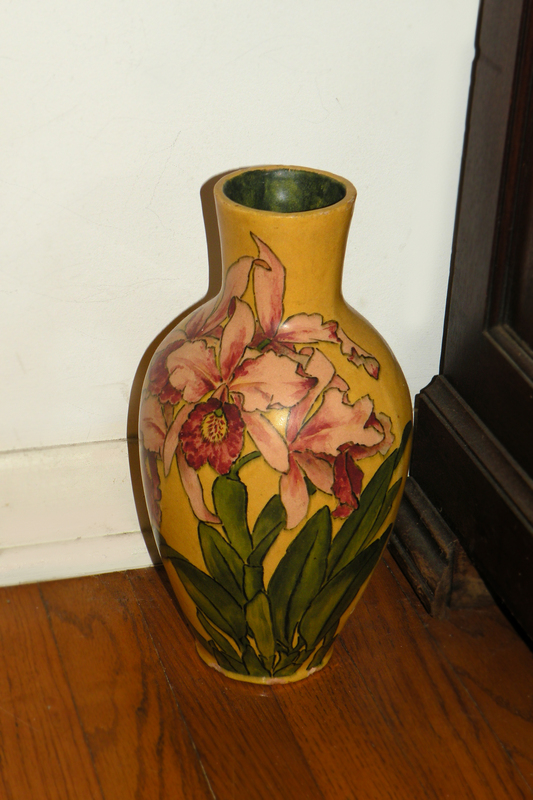 A testament to John Bennett, the vase looks as comfortable and appropriate with modern decor as it does with turn of the century arts and crafts. 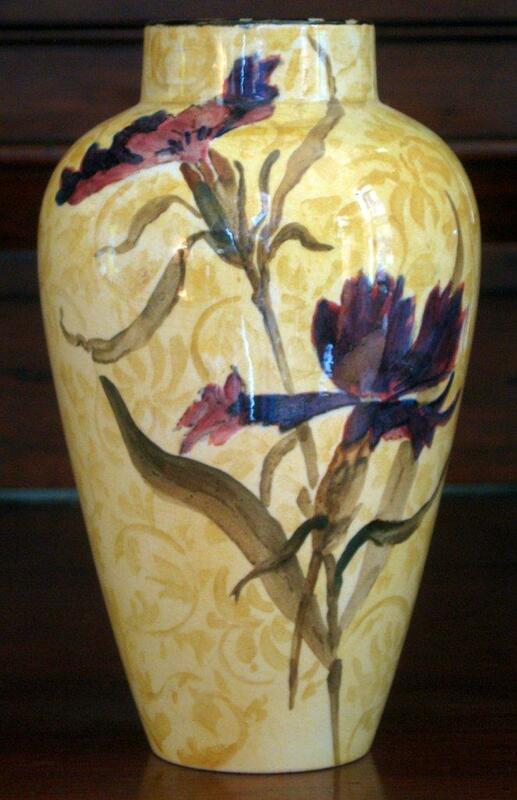 This beautiful vase stands at 15.5 inches, larger than many of the John Bennett pieces we come across. Special thanks to them for sharing their vase with us. Known for his contributions to the America Aesthetic Movement, John Bennett is referred to as an American artist. We know in 1877 he immigrated from Lambeth, England after the success of the Philadelphia Centennial Exhibition of 1876, when his work was exposed to the American public for the first time. 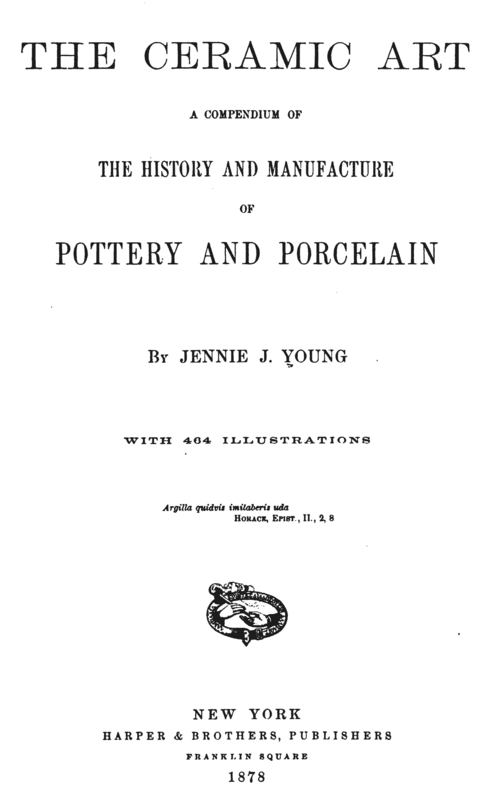 At the time he was the Director of the Faience Department of Doulton Pottery. 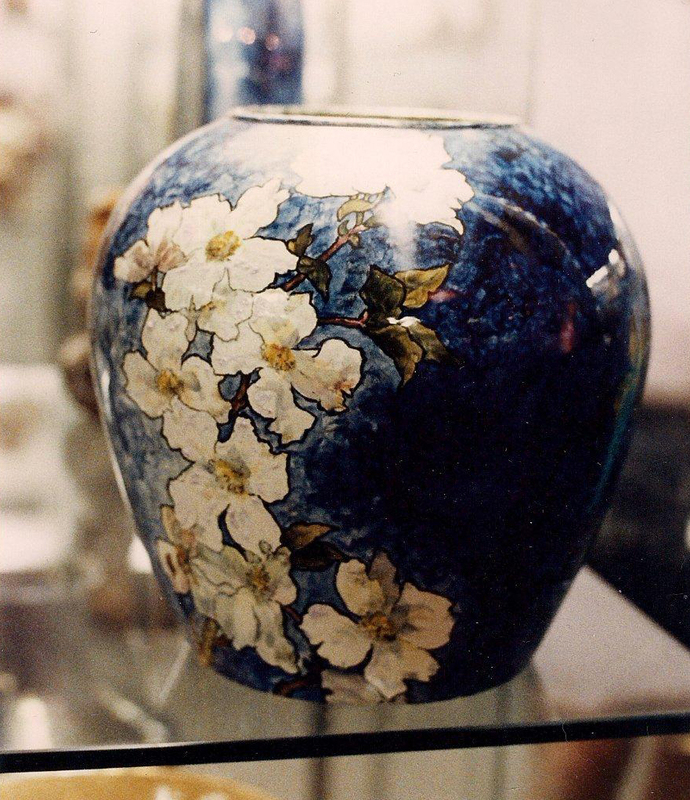 Bennett enjoyed great success in selling his pottery at Davis Collamore’s shop on Broadway and at Tiffany’s. 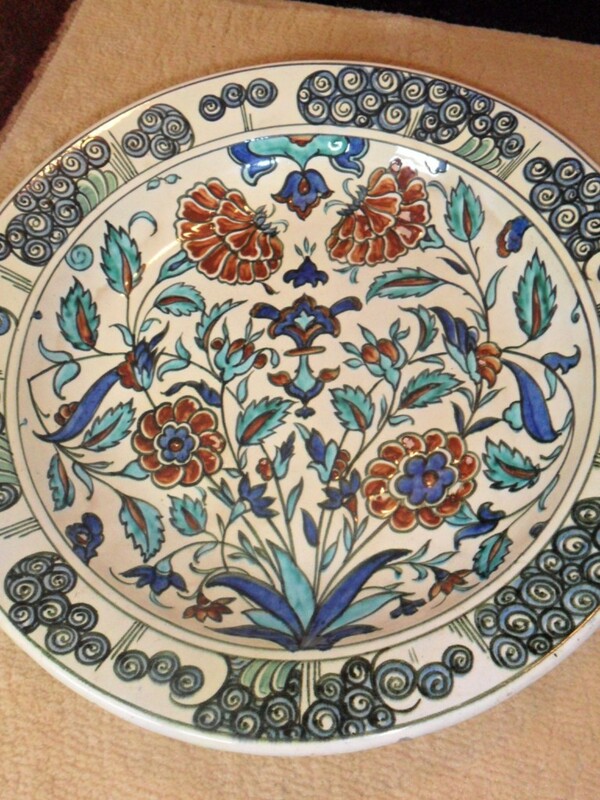 He also gave instruction in the art of Faience style pottery decoration. Bennett retired in 1882 to his farm in West Orange, New Jersey where he continued to work. He also kept a studio in London. 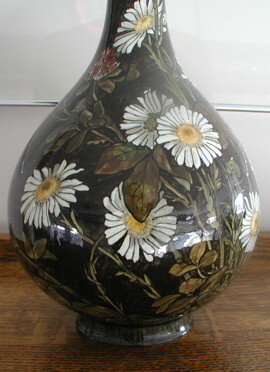 The vase below is a beautiful example of the work done in later years at his studio in London. We know he was working at his London studio during 1891-1892. 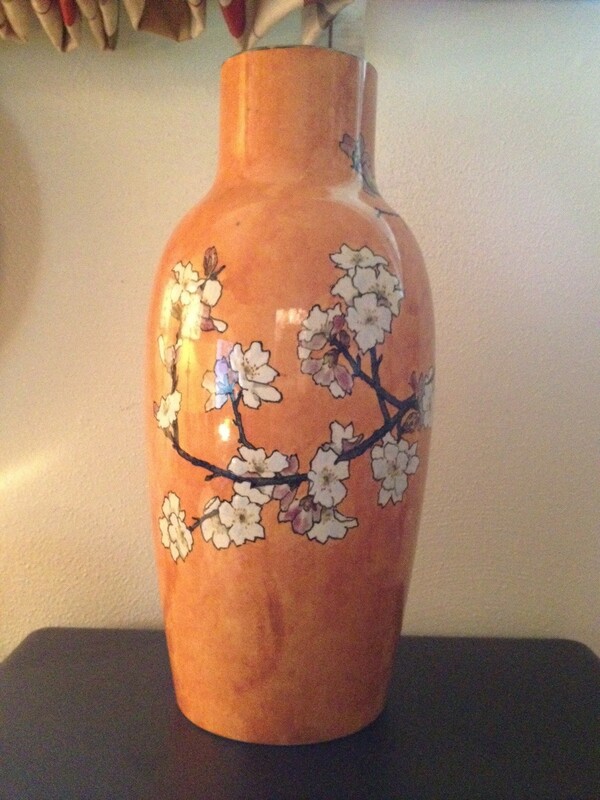 This vase, from 1892 is similar to the Peach Blossom vase (London, 1891) in my collection. The similarity includes the absence of his traditional heavy outlining seen on most of his work since the beginning of his career in the United States. 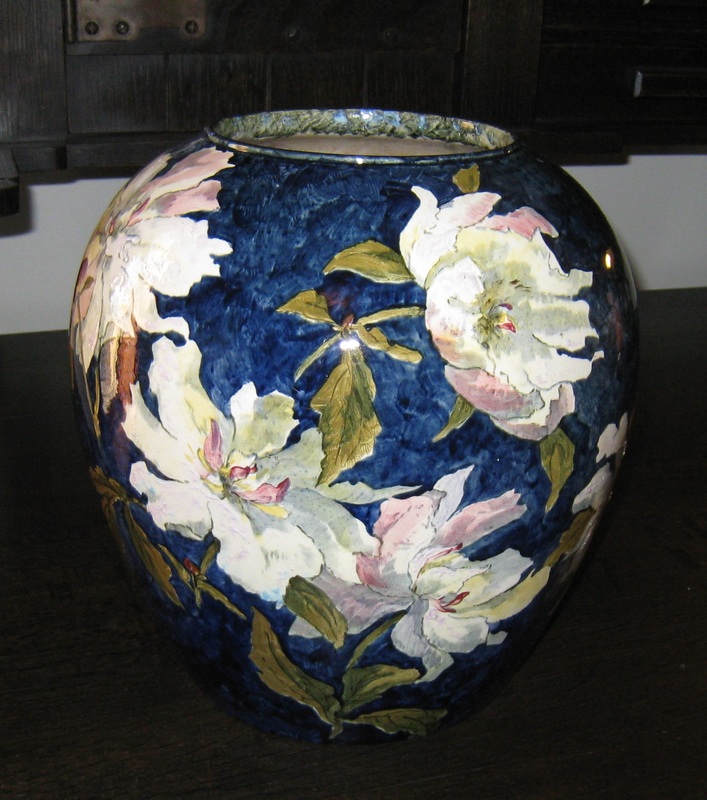 He doesn’t abandon his use of heavy outlining as it reappears in later works such as the 1906 Orchid vase, which was done in Chicago. Collection of Robert Tuggle and Paul Jeromack. 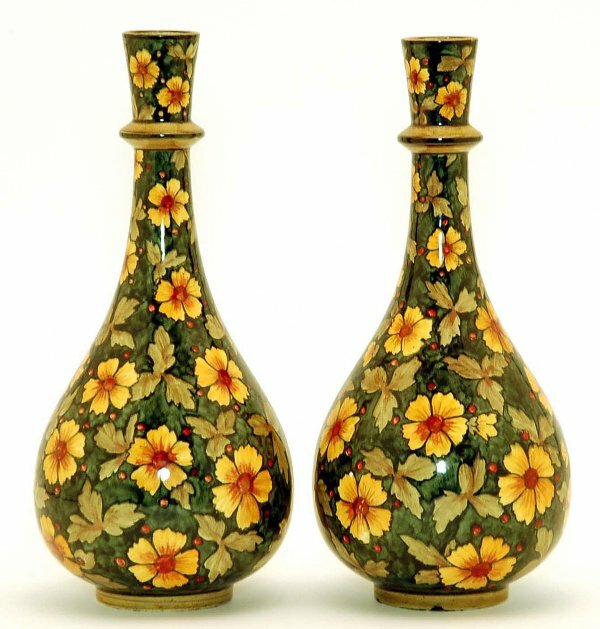 John Bennett, two London vases, completed in 1892 (left) and 1891 (right). Notice the absence of his heavy outlining. Note the return of his heavy outlining. 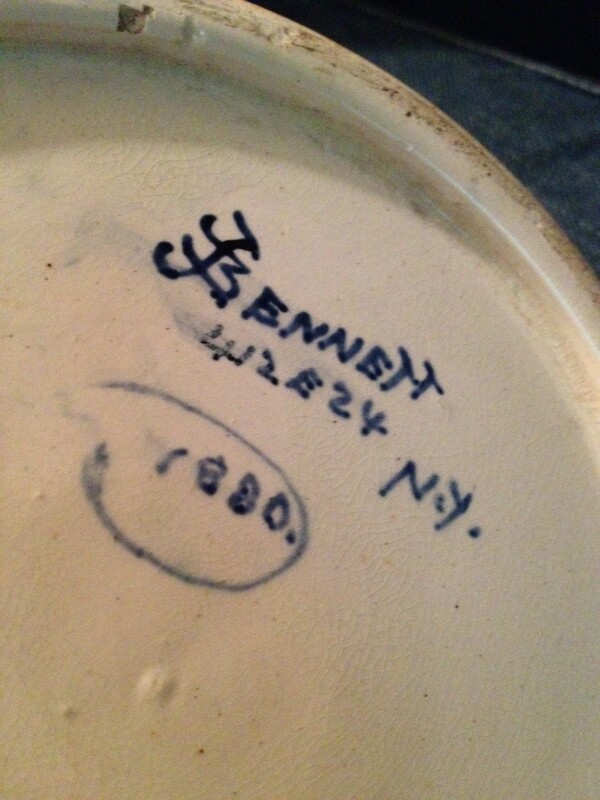 When I was younger I didn’t know how to look at Bennett pottery. It’s like I didn’t get wine tasting until I had a Port with a piece of chocolate cake. Initially I thought wine tasting was putting food that you like with wine that you like. When I had desert with the Port I finally got it! Three Bennett vases did that for me. These vases taught me another way to look at John Bennett work. Two vases (twins), are in the Bruce Barnes collection and another vase is in the collection of Robert Tuggle and Paul Jeromack. 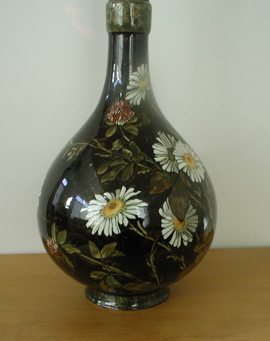 JOHN BENNETT, art pottery vases decorated with yellow flowers and red berries on a green ground. Signed under bases “Bennett 101 Lex Ave N.Y. 1877″. MEASUREMENTS: 9”. Bruce Barnes collection. The pair of vases above look like coca-cola glass with flowers that are pressed against the glass surface. In the photos it looks like you can see all the way through the vase. 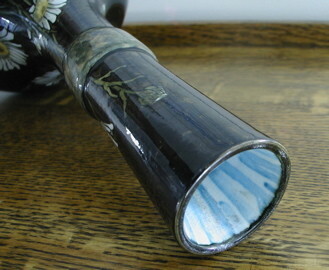 It looks like your seeing the backside of the flowers on the far side of the vase. John Bennett accomplished this by the way he handles the backgrounds. He has a watercolor style of transparent layers. As a child I thought it was messy! Now I realize it does give it a transparent look, like light is coming through the piece. 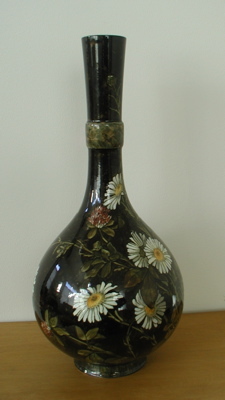 In the case of the Tuggle/Jeromack vase, the vase looks like a “glass” vessel shaped environment, filled with flowers at night. Bennett’s other style is a flattened look, like expensive “wallpaper”. My two vases are one of each look. 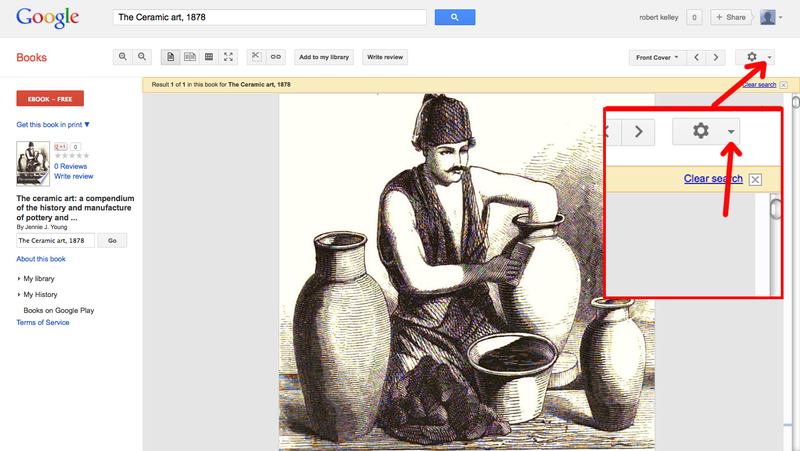 The yellow one looks flat and the small grey vase looks more atmospheric and 3-dimensional. 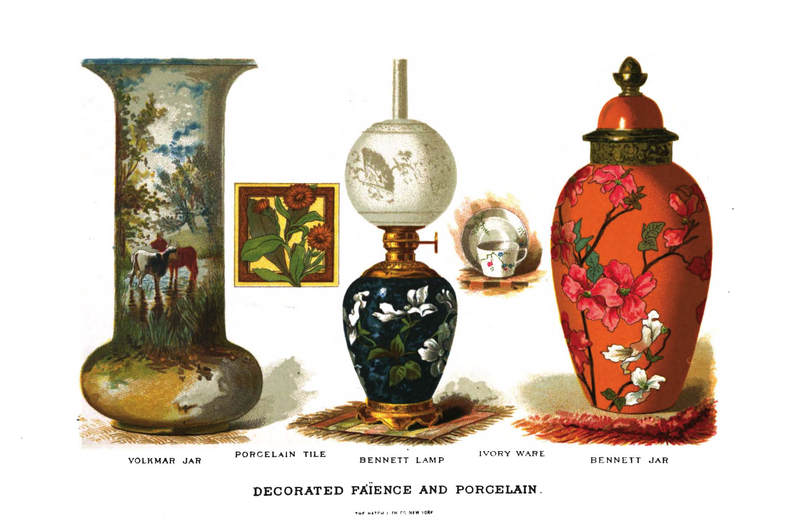 The color plate from Woman’s Handiwork in Modern Homes (1881) also demonstrates both styles. 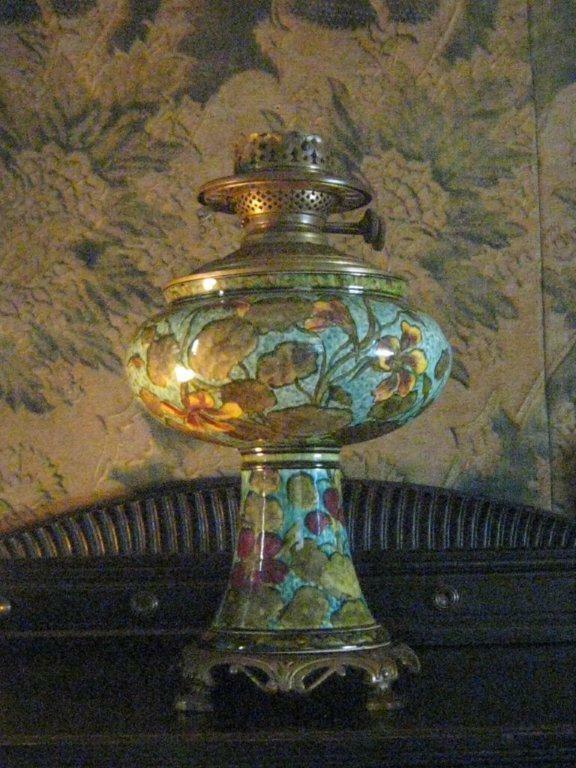 The lamp in the center looks more 3-D and atmospheric and the covered jar has the 2-dimensional, stylized wallpaper look. A portion of the book, dealing with John Bennett and a link to the complete book (which can be downloaded for free) can be found in the new “Press & Publications” section of this site (menu at top). The charger above recently sold in England. It falls into the “glass” category. 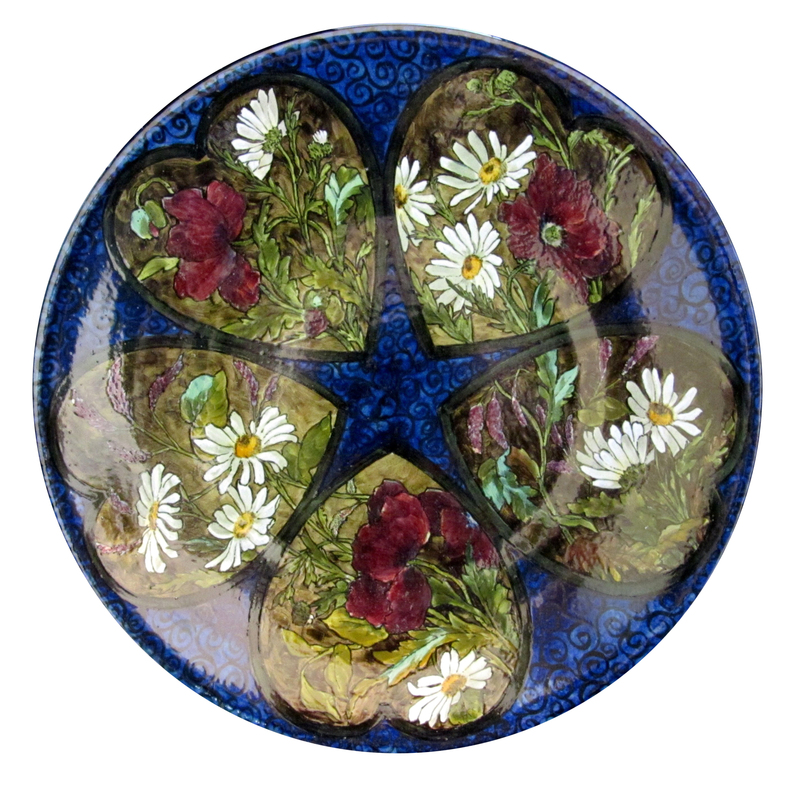 It looks like stained glass with translucent blue glass embedded with clear heart shapes that look onto a garden of flowers. When I see John Bennett pieces now, I always think of them in those two categories, “wallpaper” or “glass”. I’ve even thought that his heavy outlining was reminiscent of the lead in stained glass windows. 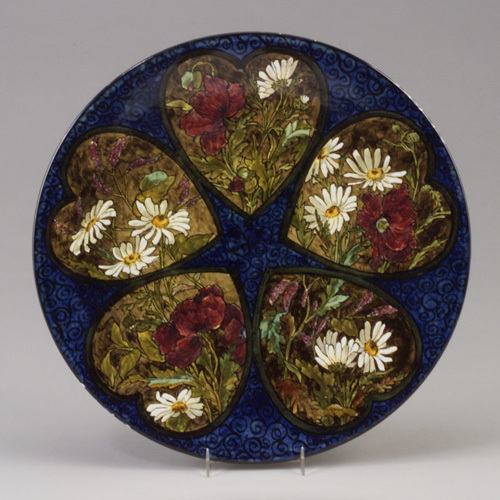 I think his Faience style, though started in England may have been influenced by his relationship with Louis Comfort Tiffany. Last night I was reading a ceramic book from 1878. Whenever I am researching for John Bennett information I secretly hope to see one of my pieces, published. That’s probably normal for any collector. 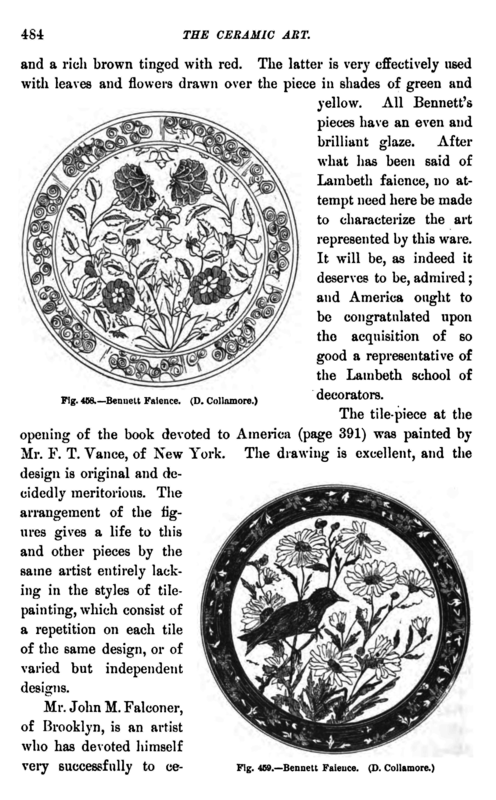 The book I was reading, The Ceramic Art, by Jennie J Young (1878) had a piece I recognized! Though not one of my pieces, it was a piece from the Bennett-Hinds Collection of Anderson Island, Washington. It was an illustration of Chuck and Carol’s charger. The charger, now 135 years old was only a year old when the book was published. If you would like to have a copy of the book, you can download it for free through Google Books. The following link will take you to the location of the book. In the picture below you can see that to download the book you click into area of the button that looks like a sprocket next to a triangle which points down (top right). Click and scroll down to Download PDF. That’s all folks. Congratulations to Chuck and Carol Bennett-Hinds for having acquired a piece that was published 134 years ago. It looks like the charger may have originally sold at Davis Collamore & Co., which was a high-end New York City importer of porcelain and glass, headed by Davis Collamore (7 October 1820 — 13 August 1887). I received pictures of the Bennett vase that the Everson Museum of Art in Syracuse, New York has in their collection. It’s beautiful! It’s covered in pale yellow dogwood on a blue ground. I saw it sometime back in a photo that appeared in a publication. I wasn’t able to determine the name of the publication but I downloaded the image. It took some time tonight going through my files to find that photo. 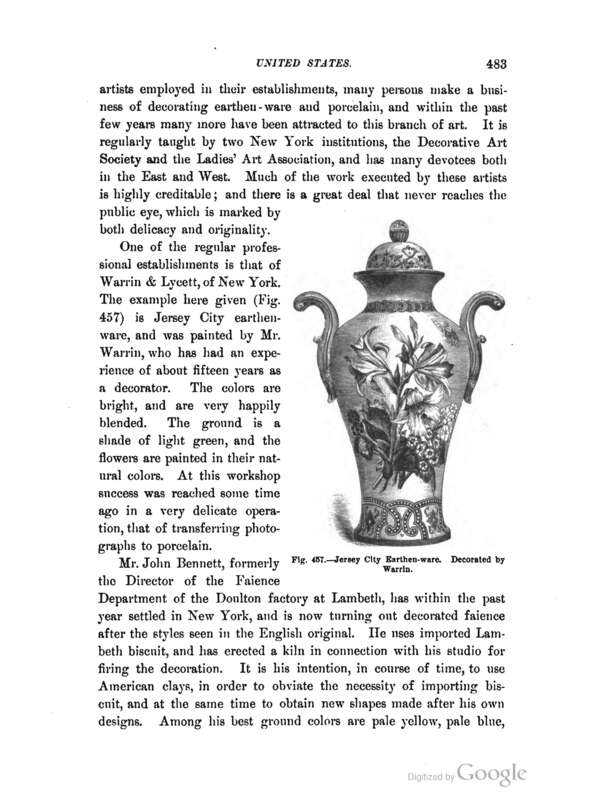 Here are the images sent to me of the John Bennett vase at the EMOA. 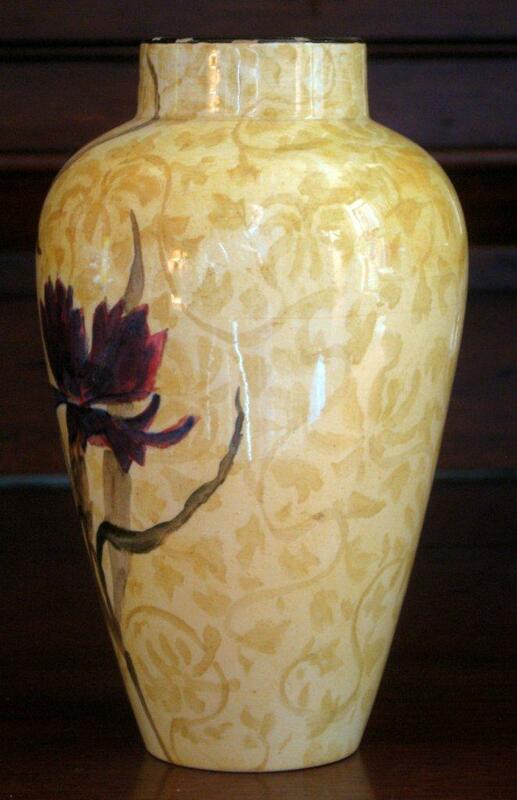 Below is a picture of the vase (along with another Bennett vase) that I had in my files. I didn’t know this was this vase at the Everson. Does the Everson vase look familiar? I think it looks like the sister to a vase purchased in late November by New York collector, Bruce Barnes, president and founder of the American Decorative Art 1900 Foundation See previous article here . The vase body looks the same and the backgrounds are similar. One difference is the flowers. 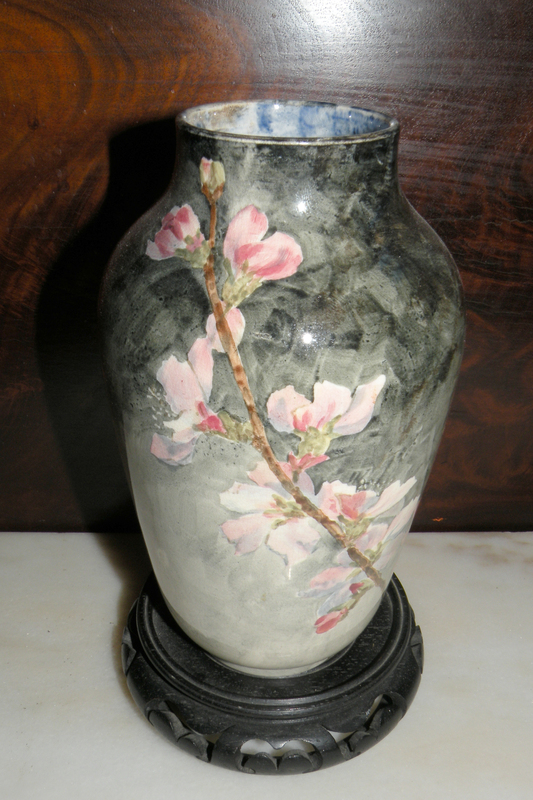 Mr. Barnes’ vase is decorated with pink and white peonies instead of the pale yellow dogwood blossoms on the Everson piece. of the Bennett vase at the Everson Museum of Art. 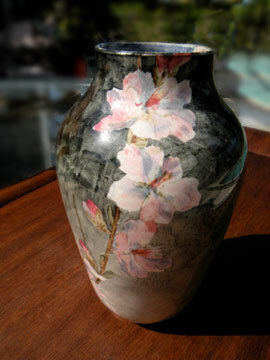 Also thanks to Bruce Barnes for the photo of his vase. at the Everson Musem of Art. or collection that hasn’t been featured on this blog? Shoot me a note and I will follow up with it in an article. Today I had the good fortune of communicating with a gentleman that seems as enthusiastic about John Bennett pottery as I am! He also has a sizable collection of John Bennett pottery. I saw this piece several years ago and have wondered what happened to it. It’s a John Bennett oil lamp. It now resides in the collection of Robert Tuggle and Paul Jeromack of New York. Their collection began in 1989 with the purchase of a 14.25 inch Bennett charger at Christies, New York. Though this is the only Bennett oil lamp that I’ve seen, Robert Tuggle mentioned seeing another one which appeared in a 19th century book. When I saw this piece the first time I copied the description that appears after the picture below. I added whose collection it belongs to now. 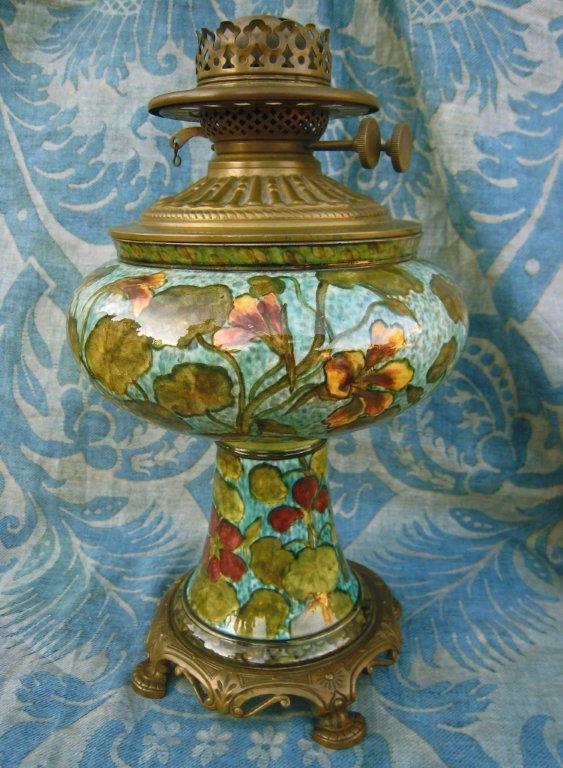 This beautiful lamp measures 14 3/4″ by 8 1/4″. 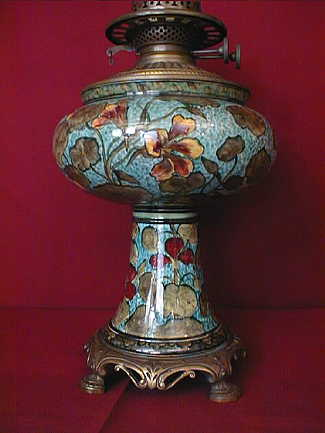 It is decorated with deep red and yellow nasturtiums on a mottled turquoise body. 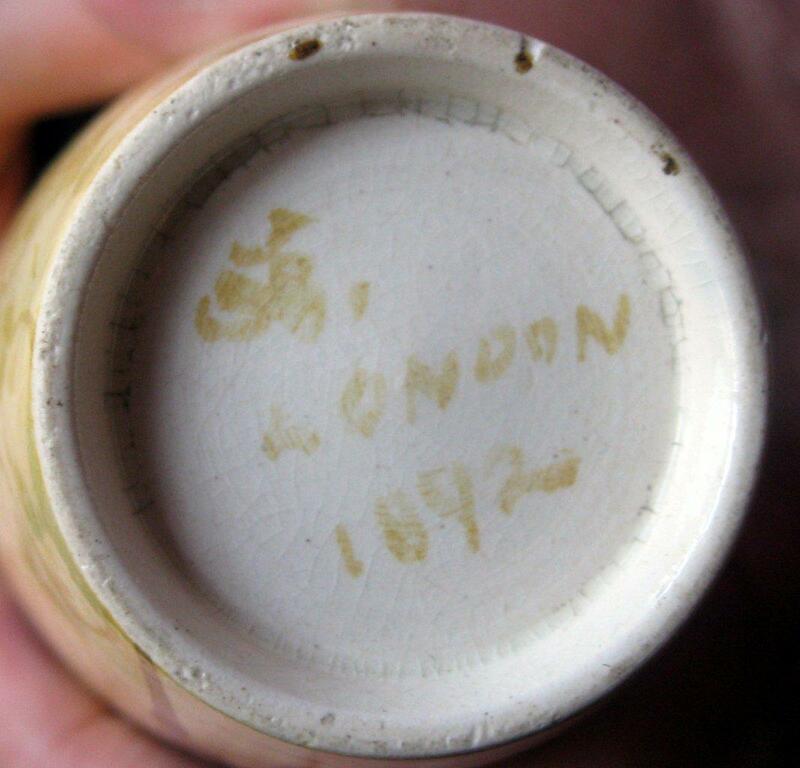 This piece is clearly marked under the base and under the glaze BENNETT E24 N.Y. with the original paper label price tag marked $26 dollars. Complete with brass feet and oil can. Collection of Robert Tuggle and Paul Jeromack. Robert also informed me of a “magnificent piece” that I didn’t know about. That piece is in the collection of the Everson Museum of Art, in Syracuse, New York. I tried to find it on their website but was unable. I contacted them to see if they could email me a picture of the piece. I can’t wait to see what that piece looks like and I am also excited about future pictures and information from Robert Tuggle and Paul Jeromack. I would like to thank Robert and Paul for sharing pictures of this piece. I hope this is the beginning of a long relationship and that we see more of their collection. I would like to wish everyone a Happy Easter and Passover. I hope you spend it with those you care about the most.